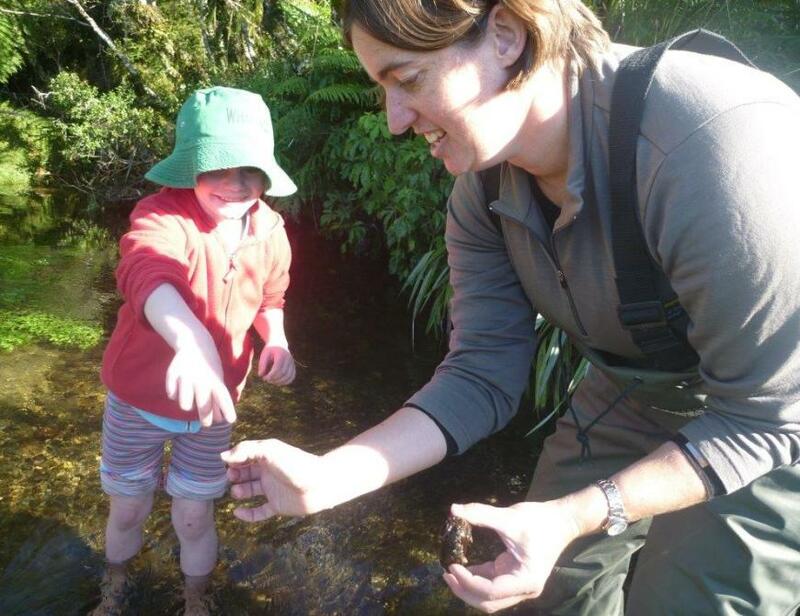 Today we profile Cornelia Vervoorn, Partnerships Ranger on the West Coast and recipient of the 2014 Stephen O’Dea Award, a scholarship for DOC staff set up in memory of Stephen O’Dea who died at Cave Creek in 1996. Everything, from falling into mud and gorse while doing grazing inspections, to trying to look knowledgeable when discussing geological sampling. I also answer questions like “what kind of eggs do stoats lay?”; prepare media releases and social media updates; and help to develop and foster partnerships. Seeing more people invest their money, time, effort, or other resources, in conservation. We all benefit from being surrounded by healthy, functioning ecosystems and having conservation recreation opportunities as a central part of our lives. Everyone says this, but he tangata, he tangata, he tangata! It’s the people I work with who make my day. Not just people in DOC, but all those people out there who passionately support conservation efforts. When one of the teenage students on a week-long Untouched World Charitable Trust education programme at Okarito said to me, “This week has changed my life. I can’t thank you guys enough for sharing this with me”. We’d worked so hard to make the week challenging enough but not overwhelming—this showed that we hit just the right note. Partnership Ranger Tim Shaw—who says he’s a cynic but has a grand plan to make South Westland weed-free, knows exorbitant amounts about ecology and always suggests a new angle for me to think about curly issues. And he never fails to remind me that there’s more to life than work—thanks Tim! 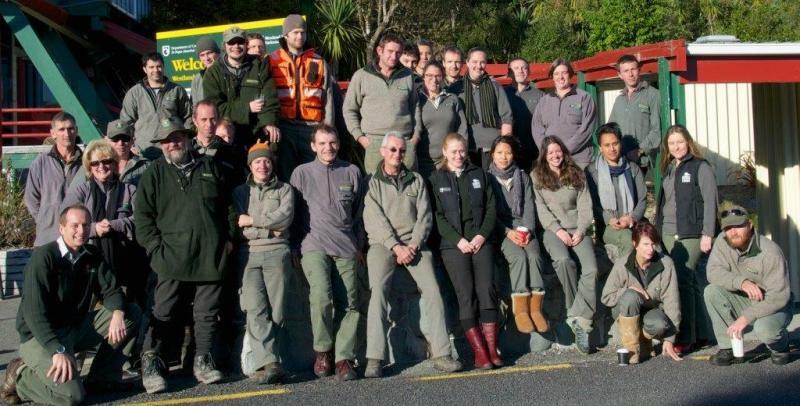 The South Westland team last year—a great bunch of people to work with! I had a picnic morning tea of louise slice and Milo with the ex-president of Slovakia, Rudolf Schuster, at Castle Rock, Ross Island, Antarctica, to celebrate his 75th birthday. I grew up in Canberra, Australia, so the Orroral Ridge was a favourite, as was the Kosciuszko Main Range. Especially the walk from Blue Lake via Lake Albina and Mt Kosciuszko to the top of the Crackenback chairlift. In New Zealand: Fox Glacier, Franz Josef Glacier and their névés have been my playground for the last 13 years. I’m also getting to know Kahurangi better now that my parents have moved to Nelson. A kea. Because they don’t take anything seriously, and get to explore from the mountains to the sea, creating havoc along the way. And I could explain to the other keas that lead roofing nails and green cereal pellets should be left well alone. I worked as an anthropologist in the Northern Territory in Australia in the late 90s/early 2000s. 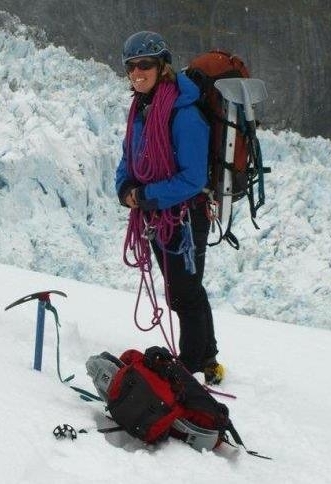 I then had a complete career change, becoming a glacier guide at Fox Glacier and then at the Matanuska Glacier in Alaska. 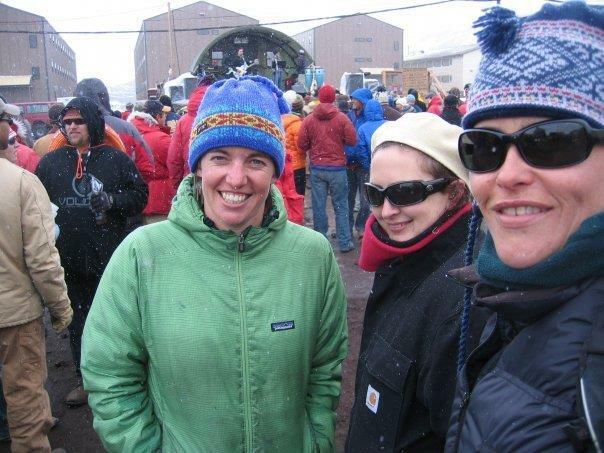 This led on to two seasons as Programme Support Assistant at Scott Base. From there I did a season at Whakapapa Ski Field on the Trail Safety Team, and two weeks with Ultimate Hikes on the Milford Track, before being poached by DOC. 1080 Beach, it’s a lovely beach! No pests, either! 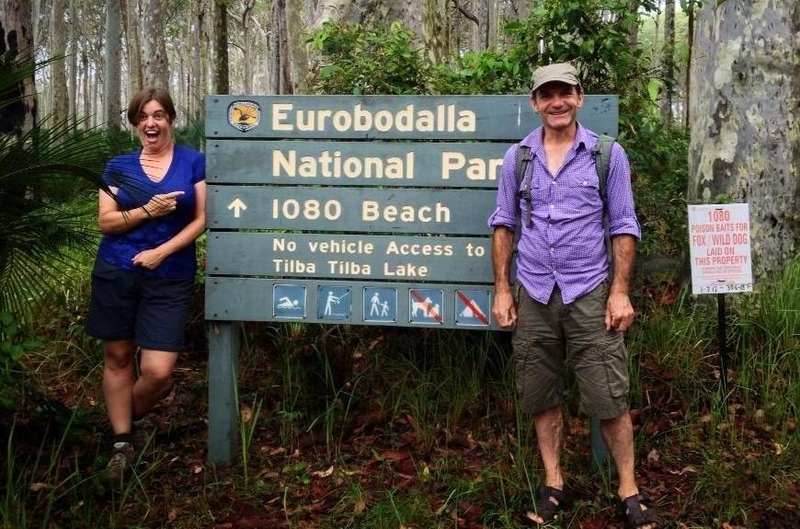 “Don’t let the bastards grind you down” — told to me by Alex Miller, ex-Chief Ranger, Westland Tai Poutini National Park and surrogate uncle. My wonderful partner Jim Livingstone! And by new opportunities to explore New Zealand and the wider world. You don’t know how lucky you are, mate. (Sung in Fred Dagg’s voice). We face problems like deteriorating water quality, species threatened with extinction etc., but the difference between us and so many countries is that we could reverse the downward trend if we had the will and made the effort as a country. The areas we have that are still largely untouched are of such value not only to us but to the world—we are the lucky custodians of these areas. We should never be tempted to sacrifice these for short term economic gain when they are worth so much more as a lasting source of joy, not to mention “ecosystem services”! What are you most looking forward to as the recipient of the Stephen O’Dea Award? The award will enable me to attend the IUCN World Parks Congress in Sydney. I look forward to seeing landscapes and ecosystems during the field trip part of the congress. Being an Aussie kid, I am partly familiar with these places, but it will be different seeing them through “conservation goggles”. For example, I love the Australian Alps for their landscapes, from reading “The Silver Brumby” as a 12 year old horse-mad kid, and for the ski trips and bushwalking trips I’ve done there. However, what I don’t know is how the area looks when you consider threatened species and ecosystems, or how these are being protected and valued by Australians. 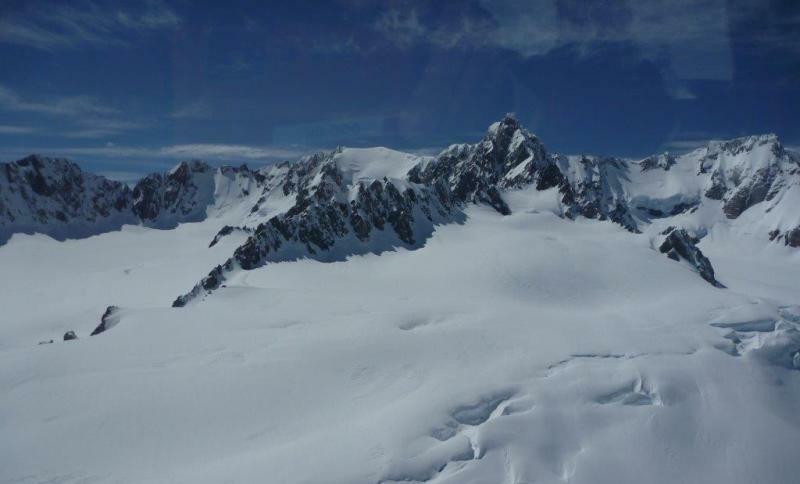 The Fox Glacier neve—an amazing place to learn to climb! That’s my favourite poem too. I know it off by heart too. How amazing. Blood, that is.